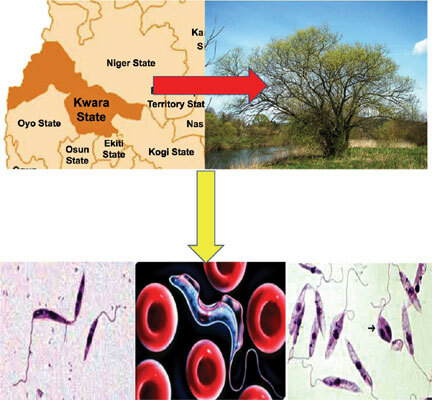 Background: Protozoal infection is endemic to the tropical regions of the world including West Africa, where high disease burden and associated deaths are reported annually. There is still a high reliability on traditional and herbal medication for the management of such diseases. Method: In this study, a total of 66 extracts of different polarity were prepared from 22 Nigerian medicinal plants belonging to 16 different families, and evaluated for antitrypanosomal, antileishmanial and antiplasmodial activities. Results: Methanol extracts of the leaves and stem of Securinega virosa and Japtropha curcas showed strong antiplasmodial activity with IC50 values generally less than 20 µg/mL. Chloroform fractions of the leaves extract of Datura metel and Calotropis procera, hexane fractions of the whole plant of Hymenocardia acida with the leaves of Morinda lucida and the methanol fractions of the leaves and stem of Nymphea odorata showed significant activity against Trypanosoma brucei brucei blood stage trypamastigotes with IC50 (µg/ml) values generally less than 5 µg/mL. No significant activity was observed in vitro against Leishmania donovani (promastigotes, axenic amastigotes and intracellular amastigotes in THP1 cells) except for the methanol and chloroform fractions of the extract from the leaves of Datura metel. Conclusion: This work partly supports the ethno-medicinal use of some of the selected medicinal plants and further research into the putative active constituents may be desirable. Herbal medicine, L. donovani, leishmaniasis, malaria, P. falciparum, Protozoal, T. brucei brucei, trypanosomiasis.